The change in customer’s buying patterns affects Apple, which makes its own changes to compensate. 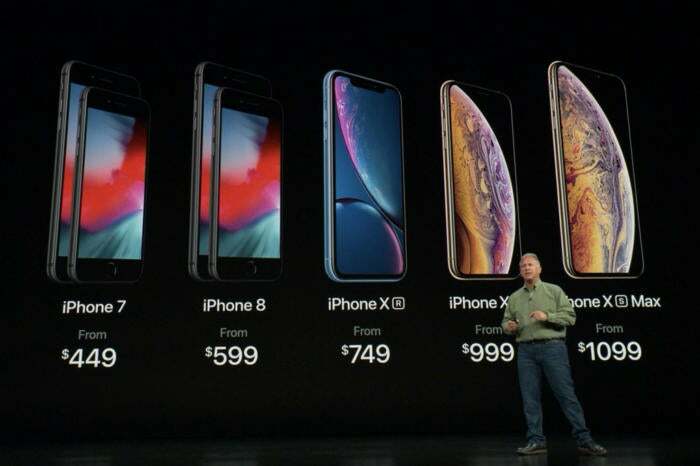 In the aftermath of last week’s Apple announcements, it’s so easy to refer to the $749 iPhone XR as a low-price, bargain model, in contrast to the $999 iPhone XS and the $1,099 iPhone XS Max. But just three years ago, $749 was what Apple charged for the most expensive new iPhone in its product line, the iPhone 6s Plus. It’s never been more expensive to walk into an Apple store and walk out with an iPhone. Changes in the way wireless carriers approach their customers have led, unsurprisingly, to changes in the buying behavior of those same smartphone users. The change in buying patterns then affects Apple, which makes its own changes to compensate. There’s a lot going on here, and while the end result is that Apple is very slowly cranking up the average selling price of the iPhone, it doesn’t necessarily mean that most people are spending more money on iPhones than they used to. Back in the day, at least in the United States, most people didn’t pay full price when they bought an iPhone. Instead, they paid a lump sum that was sold along with a 24-month contract to a wireless company. The wireless company was essentially subsidizing the overall purchase price of the phone by locking you in to a two-year contract, with part of your monthly bill going toward paying off your phone. Even if the overall amount of money you spent on the phone was actually quite high, a lot of it was deferred into monthly payments, which eased the pain. However, it was often a very bad deal for consumers, because in most plans, after two years your bill wouldn’t go down. Which, in turn, was a motivation to get a new phone every two years so you could get your money’s worth. Times have changed. These days both carriers and Apple itself offer monthly iPhone plans with built-in upgrades, structured as loans rather than as wireless contracts. It’s a more transparent system and once you pay off your phone, it’s yours. It’s also led to innovative programs like Apple’s own iPhone Upgrade Program, which gives you a monthly fee in exchange for using an iPhone for a year, turning it in for resale, and getting a newer model. You can also just walk in to an Apple Store and buy an unlocked phone for full price. No monthly plans, no complications, just a flat fee. That price is not cheap, especially compared to the old subsidized prices, but it comes without strings. The net result of this is a change in how people buy phones. If you spend $1,000 for a phone, you’re more likely to hang on to it for longer than the old two-year cycle. (Or perhaps you’ll hand it down to a family member. My son is still using an iPhone 5!) Sure, there are some people—probably including many of you—who get a new phone every year. But I’d wager that the change in how we buy phones has lengthened the phone buying cycle. Fewer new phones being bought every year is bad for Apple? What’s a company to do? Given the rosy quarterly results reported by Apple the last few years, you may be under the impression that iPhone sales are growing. 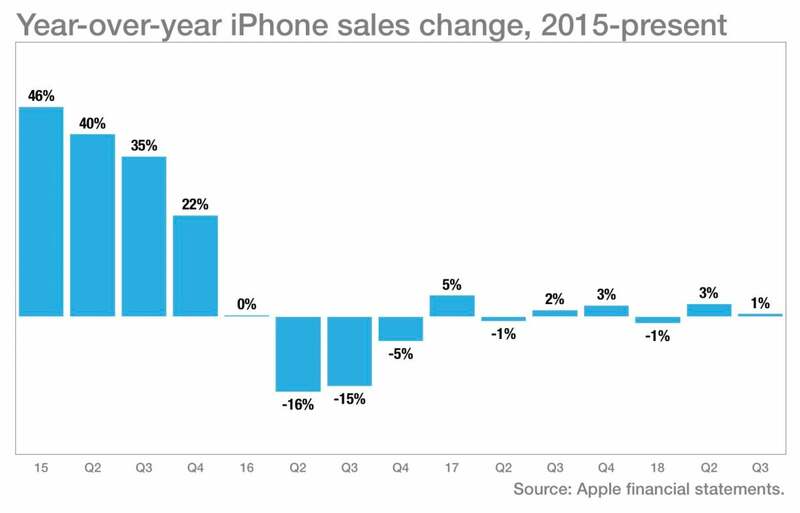 That’s not actually true: Year-over-year iPhone sales growth has been 5 percent or less for the last 11 quarters. Not good, right? If there is iPhone sales growth out there, it’s very slow growth—in the realm of a couple percentage points. 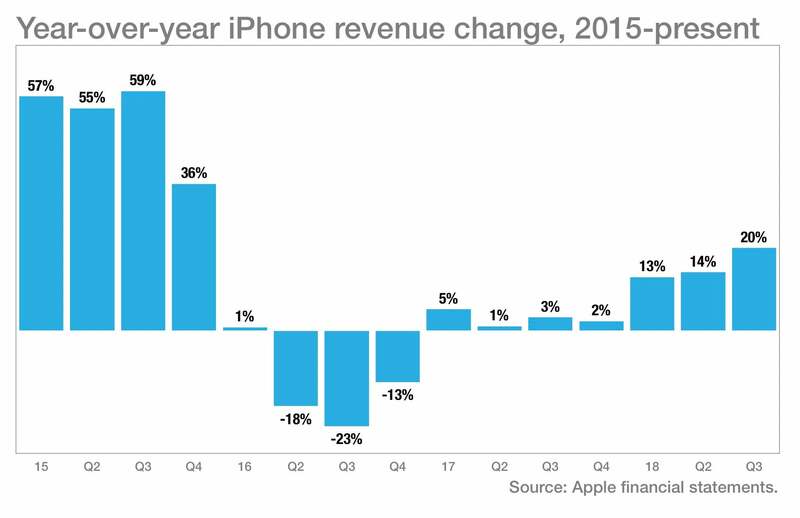 So why is Apple’s iPhone business perceived as being so strong? One reason is its outright size and profitability. Even without massive growth, the iPhone remains an enormous business that makes Apple one of the most successful and profitable companies in the world. Another reason is that while iPhone sales aren’t rising much, iPhone revenues are doing much, much better. Revenue has been up the last seven straight quarters, and the last three quarters have shown double-digit revenue growth versus the year-ago quarter. What’s going on here only requires basic math to understand. Take the amount of iPhone revenue Apple reports and divide it by the number of iPhones sold. The number you get back will be a measure of dollars per iPhone—what’s commonly called average selling price, or ASP. 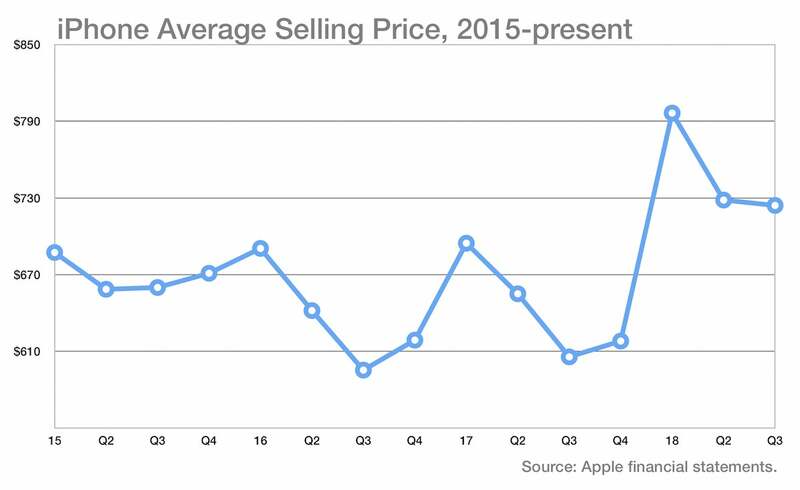 Since late 2016 and the introduction of the iPhone 7 and iPhone 7 Plus, Apple has been cranking up iPhone prices—and the ASP has followed. In 2017, the iPhone 8 ($699) and 8 Plus ($799) were both priced $50 higher than their predecessors were a year before—and a new $999 slot was introduced for the iPhone X. That brings us to this year. Apple has eliminated the $649/699 price slot for a new iPhone model altogether, replacing it with a new phone at the very top of the price list. Instead of offering $699, $799, and $999 models, it’s offering $749, $999, and $1,099 models. Unless Apple starts selling a much larger percentage of discounted past-year models as a part of its total, the ASPs can only go up. 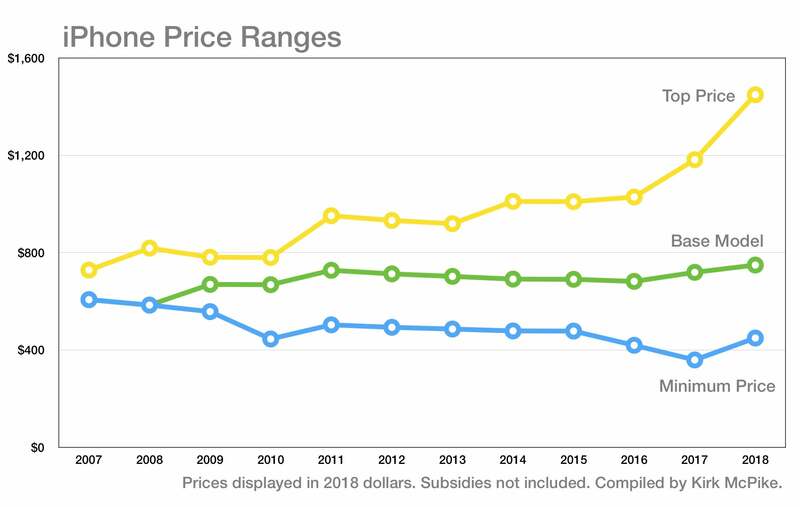 Here’s a chart (thanks to Kirk McPike for the data) that shows, historically, the sticker prices of iPhone models adjusted to 2018 dollars. I will admit that it’s an oversimplification of things, because it doesn’t factor in the long-term cost of subsidies. But it’s still useful, if only as a rough gauge of how Apple shapes its iPhone product line. The top line is the price of the most expensive iPhone you can buy. This line has skyrocketed in the past two years, thanks to the iPhone X and XS. This is Apple capturing money from customers who were presumably always willing to pay more for a top-of-the-line iPhone. The middle line is the price of the base model of the lowest-priced new iPhone model. Viewed through the chart’s adjustment to 2018 dollars, it seems like Apple is actually being fairly consistent with the size of the price tag it wants to see on its base-level iPhone. The bottom line is the price of the cheapest iPhone model being sold directly from Apple—generally a past-year model or the iPhone SE. Again, this actually shows some consistency on Apple’s part—and it makes the discontinuation of the iPhone SE seem a little more like a correction to a trend that had gone too far downward. I read the widening gap between the top and bottom lines of this chart as Apple’s pulling apart of the iPhone product line to widen the appeal of the product. Apple wants to sell as many $1449 511GB iPhone XS Max units as it can; it’s also happy to sell the iPhone 7 to someone for $449—a full thousand dollars less. 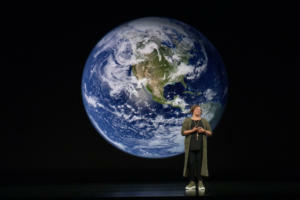 One of the most interesting statements at the iPhone event last week was Lisa Jackson’s claim that Apple is very much dedicated to lengthening the usable life of iPhones. Of course, iOS 12 is also focused on improved its performance on older devices. Apple VP Lisa Jackson at the September 12 Apple iPhone event. This is not just marketing talk. (It’s marketing talk, sure, but it’s not just marketing talk.) This is part of the same picture, of a changed global smartphone market. In this new world, phones cost more up front, but they are usable longer, and retain more of their value if re-sold (or reclaimed by a subscription program in exchange for a new phone) after a year or two. When people keep their phones longer, what do phonemakers do? Make more expensive phones, ideally ones that last longer. That’s exactly what Apple’s doing. If you’re someone who buys the most expensive iPhone every year, there’s no denying that you’ll be paying a lot more. But maybe you can get a good deal by selling last year’s model to make up for it.